Any mild dishwashing liquid works well. Avoid harsh kitchen cleaners and "degreasers." and a little liquid . Gently wash the parts with a soft cloth. Rinse very well in warm water. Pat the Rosary dry with a soft, lint-free cloth. 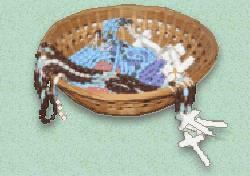 Allow the Rosary to air dry before storing. See below for special handling of certain parts. to dip your Rosary in the cleaning solution. then lift the basket out draining off the excess fluid. Clean beads with a soft cloth under warm running water until all the solution is thoroughly rinsed off. which is handled regularly, will not tarnish. an allergic reaction to silver. ...but it does turn the Silver black. A silver-polishing cloth will restore the Sterling parts to look like brand new. you may want to use a commercial silver cleaning cloth, like those shown above. 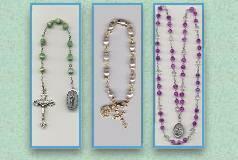 Can you clean a Rusty Rosary? consisting chiefly of ferric hydroxide and ferric oxide formed by oxidation. unless stored in moist conditions, in water, or left unused. Although various sites on the internet tout the removal of rust by using a solution of water and AlkaSeltzer, we found that it has no effect on the rust. However, it did a fine job of cleaning all the types of rosaries we cleaned, from sterling parts to pearls, and it did no harm. We did not immerse antiqued metal in the solution for fear the antiquing would dissolve. but we haven't had much luck with these either! please just let us know and we will do our best to help.